Background: Maintenance medications provide symptomatic relief, improve lung function and reduce the risk of exacerbations in patients with chronic obstructive pulmonary disease (COPD). Despite their proven benefits, limited information exists on maintenance medication use and adherence among users. Objective: We examined the patterns and factors associated with the receipt of and adherence to maintenance medication in individuals with COPD. 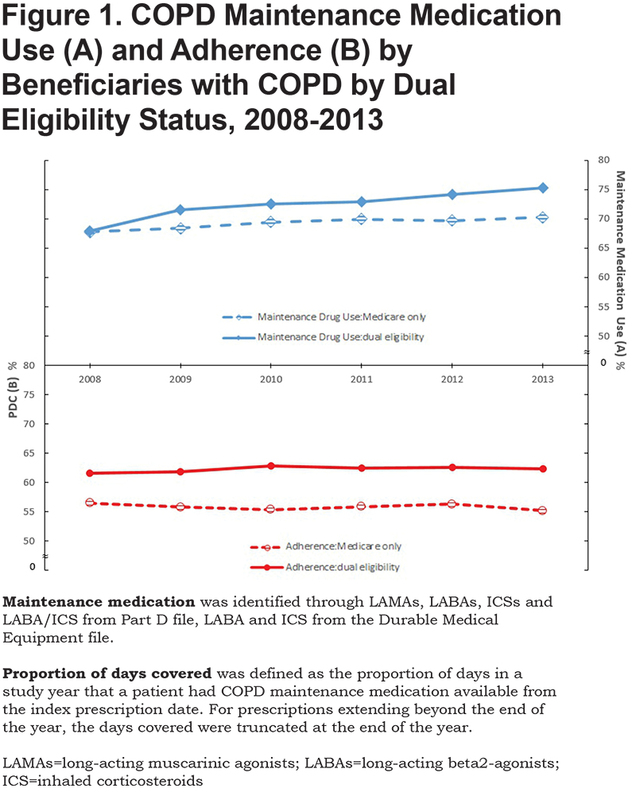 Methods: A retrospective cross-sectional study of 5% of Medicare beneficiaries enrolled in Parts A, B and D with COPD who received maintenance medication from 2008 to 2013 was conducted. Maintenance medication includes: inhaled corticosteroids (ICSs), long-acting beta2- agonists (LABAs) and long-acting muscarinic antagonists (LAMAs) alone or in combination. We examined the proportion of beneficiaries with COPD who had at least one prescription filled for maintenance medication. Among users of maintenance medications, we also examined adherence, defined as proportion of days covered (PDC) ≥80% over the year from the first maintenance medication prescription fill date. Results: Overall, maintenance medication (LAMAs, LABAs, ICSs and/or LABA/ICS) use increased from 67.8% in 2008 to 72.1% in 2013. The increase is related to increases in use of LABA/ICS, which rose from 41.1% in 2008 to 49.6% in 2013. Factors associated with receipt of maintenance medication include female gender, recent COPD hospitalization (odds ratio [OR] 1.63; 95% confidence interval [CI] 1.54-1.73), oxygen therapy (OR 1.74 95% CI, 1.68-1.81), dual eligibility status (OR 1.45; 95% CI 1.39-1.51), higher education level and evaluation by a pulmonary provider (OR 1.88; 95% CI 1.81-1.96). The overall adherence among maintenance medication users remained flat. The most important factor associated with adherence was dual eligibility status (OR, 1.67; 95% CI: 1.59-1.75). Conclusions: Receipt of maintenance medications increased during the study period and was higher in those with dual eligibility. Overall, adherence to maintenance medications was suboptimal and remained unchanged. Funding/Support: This work was supported by the Agency for Healthcare Research and Quality (R01-HS020642), the Patient-Centered Outcomes Research Institute (1R24HS022134-03), the Clinical and Translational Science Award (1UL1TR001439-01) from the National Center for Advancing Translational Sciences, and the Claude D. Pepper OAIC grant # P30 AG024832-11. Funders had no role in the preparation, approval or submission of the results. We used a 5% national sample of Medicare beneficiaries with COPD to examine the pattern of maintenance medication use and adherence among maintenance medication users from 2008-2013.We also examined factors associated with the receipt of and adherence to maintenance medication. Our hypothesis was that the overall use of maintenance medication would increase during the study period, but the magnitude of increase would be impacted by the financial burden to the patient. Data from the following files were used for this study: 1) Denominator file (Medicare enrollment information and demographic data); 2) Medicare Provider Analysis and Review file (claims for hospital inpatient and skilled nursing facility stays); 3) Outpatient Standard Analytic File (hospital outpatient services); 4) 100% Physician/Supplier file (physician and other medical services); 5) Durable Medical Equipment (DME) file; and 6) Part D Drug Event file. 3) An acute care hospitalization for respiratory failure (ICD-9 codes 518.81, 518.82, 518.84) as the primary discharge diagnosis and COPD listed as the secondary diagnosis. 5) Were residents in 1 of 9 United States geographic regions. A spirometry examination was identified through Current Procedural Terminology codes (94010, 94014, 94015, 94016, 94060, 94070, 94620). Oxygen therapy use was defined from Healthcare Common Procedure Coding System codes E1390-E1392. Outpatient pulmonary specialist visit was defined as any outpatient visit with a Health Care Financing Administration provider specialty code (“29”) during the study year. Our outcomes of interest were receipt of COPD maintenance medication and maintenance medication adherence in each study year of interest for individuals with COPD. The COPD maintenance medications included LABAs, LAMAs, ICSs, and fixed-dose LABA/ICS combinations. Medication prescriptions and prescribed dosages were extracted from Part D and DME prescriptions filled. We chose to look at DME files as nebulized medication is covered under DME benefits. For each year, the proportion of days covered (PDC), defined as the proportion of days in a study year that a patient had COPD maintenance medication available from the index prescription filled date, was calculated. The index date was defined as the earliest date a maintenance medication prescription was filled during the study year. For prescriptions extending beyond the end of the year, the days covered were truncated at the end of the year. Beneficiaries were classified as adherent if their PDC ≥80%. Patient characteristics were summarized from 2008-2013 using counts and percentages of categorical variables. A generalized estimate equation (GEE) with binomial distribution model analysis was used to assess the trend in outcomes, adjusted for patient characteristics (age, gender, race, dual eligibility status, education level and comorbidity) and health care measures (COPD hospitalization in the previous year, having a spirometry test, oxygen therapy treatment and pulmonary specialist visit). The GEE accounted for the cluster effect of individuals.20 A priori 2-way interactions on maintenance medication use and adherence was tested between dual eligibility status and education level, and between dual eligibility and study years. All analyses were performed using SAS version 9.4 (SAS Inc., Cary, North Carolina). All reported p-values were two-sided with p<0.05 considered statistically significant. Table 1 presents the baseline characteristics of beneficiaries with COPD by study year. The number of individuals with COPD increased from 13,957 to 18,044. The majority were female, non-Hispanic white and had ≥2 comorbidities. Over a third of beneficiaries were prescribed home oxygen therapy, were seen by a pulmonary specialist and had spirometry testing. 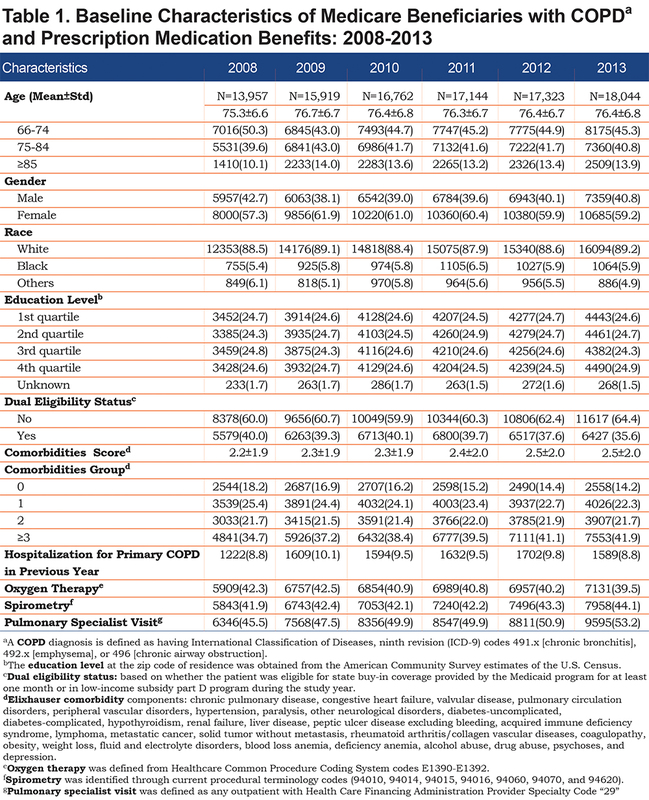 Table 2 presents receipt of COPD-related medications during the study period. Receipt of any COPD-related medication increased from 85.6% in 2008 to 87.1% in 2013. Approximately 72% of individuals filled some reliever medication, most commonly short-acting beta2-agonists (SABAs) as metered dose inhaler and SABA/SAMA nebulized solutions. Maintenance medication (LAMAs, LABAs, ICSs and/or LABA/ICS combos) increased from 67.8% in 2008 to 72.1% in 2013. The increase in any maintenance medication during the study period was related to the increase in LABA/ICS combination use, which rose from 41.1% in 2008 to 49.6% in 2013. In contrast, use of an ICS alone decreased from 19.3% in 2008 to 15.7% in 2013. Overall, receipt of LABA prescriptions did not change over the study period. However, handheld device LABA prescriptions decreased, whereas nebulized LABA prescriptions increased, from 3.5% in 2008 to 6.2% in 2013. The receipt of maintenance medications by beneficiaries with COPD seen by a pulmonary specialist was high (77.1%-79.0%) but remained unchanged during the study period. In contrast, maintenance medication prescriptions filled by beneficiaries seen by primary care providers increased from 60.1% in 2008 to 64.6% in 2013. Across all study years, a higher proportion of women than men received maintenance medication. By gender, maintenance medication prescriptions filled increased from 68.8% in 2008 to 73.1% in 2013 in women and from 66.6% in 2008 to 70.6% in 2013 in men. Figure 1 presents maintenance medication use (A) and adherence (B) by dual eligibility status. During the entire study period, a higher percentage of beneficiaries with dual eligibility status had maintenance medications filled compared to those who had Medicare only, suggesting that co-payment or deductible plays a role in the use of higher cost prescriptions. To examine adherence (B), we performed a subset analysis using beneficiaries who filled a prescription of any maintenance medication during the calendar year. As shown in the figure, individuals with dual eligibility status had a higher mean PDC over the study period, but the mean PDC of either group did not change over the study period. Table 3 presents the multivariable analyses of odds of receipt of prescription (A) and odds of adherence (B) (defined as PDC ≥80%) among beneficiaries who filled a maintenance medication prescription. There was a 4% (odds ratio [OR] 1.04; 95% confidence interval [CI] 1.03-1.05) increase in the odds of receiving a maintenance medication prescription per year from 2008 to 2013. The odds of receiving a maintenance medication were higher among individuals who were younger, female, with dual eligibility status (OR 1.45; 95% CI 1.39-1.51), with more education and those with fewer comorbidities. 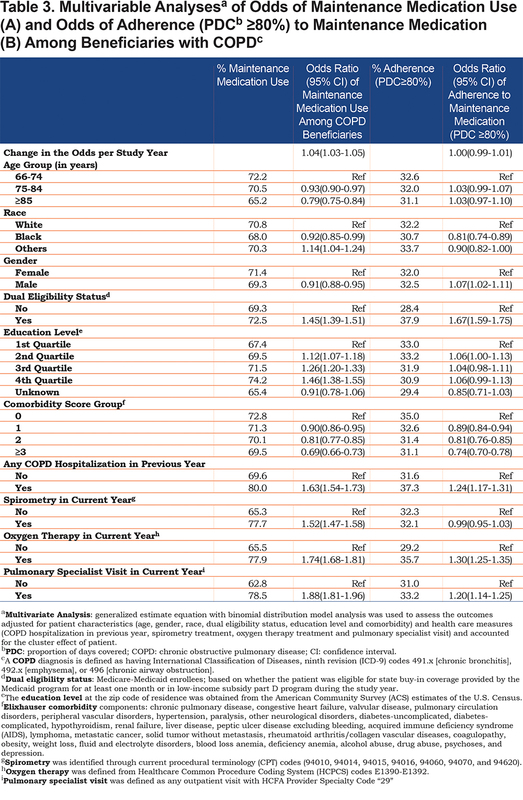 Beneficiaries who had a COPD hospitalization in the previous year (OR 1.63; 95% CI 1.54-1.73), had spirometry testing (OR 1.52; 95% CI 1.47-1.58), received oxygen therapy (OR 1.74; 95% CI 1.68-1.81) or were seen by a pulmonary specialist provider (OR 1.88; 95% CI 1.81-1.96) also had higher odds of receiving a prescription for a maintenance medication. In a subset analysis using individuals who filled a maintenance medication prescription, overall, there was no increase in the odds of adherence to maintenance medications during the study period. Factors associated with higher odds of adherence among individuals prescribed a maintenance medication include: dual eligibility status (OR 1.67; 95% CI 1.59-1.75), lower comorbidity burden, prior COPD hospitalization (OR 1.24; 95% CI 1.17-1.31), receipt of oxygen therapy (OR, 1.30; 95% CI, 1.25-1.35) and evaluation by a pulmonary specialist (OR 1.20; 95% CI 1.14-1.25). We further looked at the interaction of dual eligibility status by education level and dual eligibility status by year and found no significant effect on the interaction between dual eligibility status and education level in either model (maintenance medication prescription or adherence). However, the interaction of dual eligibility status by year had a significant effect on the maintenance medication prescription model. After adjusting for covariates as shown in Table 3, beneficiaries with dual eligibility status had a greater increase (OR 1.12; 95% CI 1.09-1.16) in the rate of receiving a maintenance medication prescription per year than those with Medicare only (OR 1.02; 95% CI 1.01-1.04); But in the adherence model, the interaction effects in both groups (with dual eligibility status and Medicare only) were not significant (OR 1.01; 95% CI 0.98-1.04 versus OR 0.99; 95% CI 0.98-1.01). dual eligible (i.e., dual eligibility status) beneficiaries with COPD are more likely to receive a maintenance medication prescription and had a higher rate of increase in receipt of maintenance medications over time. Overall adherence to maintenance medication in this population remains suboptimal. In summary, maintenance medication use in fee-for-service Medicare beneficiaries increased during the study period and is higher in dual eligible beneficiaries. However, the overall adherence to maintenance medications is suboptimal and remains unchanged. SPEN: Made substantial contributions to 1) conception and design, interpretation of data; 2) drafting the article or revising it critically for important intellectual content; and 3) final approval of the version to be published; guarantor of the paper; MM: 1) interpretation of data; 2) drafting the article or revising it critically for important intellectual content; and 3) final approval of the version to be published; WZ: 1) acquisition of data, 2) analysis and interpretation of data, 3) final approval of the version to be published; Y-FK: 1) substantial contributions to conception and design, 2) analysis and interpretation of data, 3) final approval of the version to be published; GS: 1) substantial contributions to conception and design, acquisition of data, or analysis and interpretation of data; 2) drafting the article or revising it critically for important intellectual content; and 3) final approval of the version to be published. GS serves on the advisory board of Theravance Biopharma, Mylan and Sunovion pharmaceutical companies. The other co-authors have no financial conflicts of interest to disclose. 1. Global Initiative for Chronic Obstructive Lung Disease (GOLD). Global Strategy for the Diagnosis, Management and Prevention of COPD 2017. GOLD website. http://goldcopd.org. Published January 2017. Accessed October 2017. 2. Kew KM, Dias S, Cates CJ. Long-acting inhaled therapy (beta-agonists, anticholinergics and steroids) for COPD: a network meta-analysis. Cochrane Database Syst Rev. 2014(3):CD010844. doi: https://doi.org/10.1002/14651858.CD010844.pub2. 3. Chong J, Leung B, Poole P. Phosphodiesterase 4 inhibitors for chronic obstructive pulmonary disease. Cochrane Database Syst Rev. 2013(11):CD002309. doi: https://doi.org/10.1002/14651858.CD002309.pub4. 4. Vestbo J, Anderson JA, Calverley PM, et al. Adherence to inhaled therapy, mortality and hospital admission in COPD. Thorax. 2009;64(11):939-943. doi: https://doi.org/ 10.1136/thx.2009.113662. 5. Rand CS, Nides M, Cowles MK, Wise RA, Connett J. Long-term metered-dose inhaler adherence in a clinical trial. The Lung Health Study Research Group. Am J Respir Crit Care Med. 1995;152(2):580-588. doi: https://doi.org/10.1164/ajrccm.152.2.7633711. 6. Tashkin DP, Celli B, Senn S, et al. A 4-year trial of tiotropium in chronic obstructive pulmonary disease. N Engl J Med. 2008;359(15):1543-1554. doi: https://doi.org/10.1056/NEJMoa0805800. 7. Nilsson JL, Haupt D, Krigsman K, Moen J. Asthma/COPD drugs reflecting disease prevalence, patient adherence and persistence. Expert Rev Respir Med. 2009;3(1):93-101. doi: https://doi.org/10.1586/17476348.3.1.93. 8. Krigsman K, Moen J, Nilsson JL, Ring L. Refill adherence by the elderly for asthma/chronic obstructive pulmonary disease drugs dispensed over a 10-year period. J Clin Pharm Ther. 2007;32(6):603-611. doi: https://doi.org/10.1111/j.1365-2710.2007.00866.x. 9. Osterberg L, Blaschke T. Adherence to medication. N Engl J Med. 2005;353(5):487-497. doi: https://doi.org/10.1056/NEJMra050100. 10. Albrecht JS, Park Y, Hur P, et al. Adherence to maintenance medications among older adults with chronic obstructive pulmonary disease: The role of depression. Ann Am Thorac Soc. 2016. doi: https://doi.org/10.1513/AnnalsATS.201602-136OC. 11. Koehorst-ter HK, Movig K, van der Valk P, van der Palen J, Brusse-Keizer M. The influence of type of inhalation device on adherence of COPD patients to inhaled medication. Expert Opin Drug Deliv. 2016;13(4):469-475. doi: https://doi.org/10.1517/17425247.2016.1130695. 12. Krauskopf K, Federmn AD, Kale MS, et al. Chronic obstructive pulmonary disease illness and medication beliefs are associated with medication adherence. COPD. 2015;12(2):151-164. doi: https://doi.org/10.3109/15412555.2014.922067. 13. Tottenborg SS, Lange P, Johnsen SP, Nielsen H, Ingebrigtsen TS, Thomsen RW. Socioeconomic inequalities in adherence to inhaled maintenance medications and clinical prognosis of COPD. Respir Med. 2016;119:160-167. doi: https://doi.org/10.1016/j.rmed.2016.09.007. 14. Toy EL, Beaulieu NU, McHale JM, et al. Treatment of COPD: Relationships between daily dosing frequency, adherence, resource use, and costs. Respir Med. 2011;105(3):435-441. doi: https://doi.org/10.1016/j.rmed.2010.09.006. 15. Turan O, Turan PA, Mirici A. Parameters affecting inhalation therapy adherence in elderly patients with chronic obstructive lung disease and asthma. Geriatr Gerontol Int. 2016; 17(6).999-1005. doi: https://doi.org/10.1111/ggi.12823. 16. Nishi SP, Wang Y, Kuo YF, Goodwin JS, Sharma G. Spirometry use among older adults with chronic obstructive pulmonary disease: 1999-2008. Ann Am Thorac Soc. 2013;10(6):565-573. doi: https://doi.org/10.1513/AnnalsATS.201302-037OC. 17. Make B, Dutro MP, Paulose-Ram R, Marton JP, Mapel DW. Undertreatment of COPD: a retrospective analysis of US managed care and Medicare patients. Int J Chron Obstruct Pulmon Dis. 2012;7:1-9. doi: https://doi.org/10.2147/COPD.S27032. 18. Sustic A, Krstulovic B, Eskinja N, Zelic M, Ledic D, Turina D. Surgical tracheostomy versus percutaneous dilational tracheostomy in patients with anterior cervical spine fixation: preliminary report. Spine. 2002;27(17):1942-1945. doi: https://doi.org/10.1097/00007632-200209010-00026. 19. Elixhauser A, Steiner C, Harris DR, Coffey RM. Comorbidity measures for use with administrative data. Medical Care. 1998;36(1):8-27. doi: https://doi.org/10.1097/00005650-199801000-00004. 20. Zou G. A modified poisson regression approach to prospective studies with binary data. Am J Epidemiol. 2004;159(7):702-706. doi: https://doi.org/10.1093/aje/kwh090. 21. Simoni-Wastila L, Wei YJ, Qian J, et al. Association of chronic obstructive pulmonary disease maintenance medication adherence with all-cause hospitalization and spending in a Medicare population. Am J Geriatr Pharmacother. 2012;10(3):201-210. doi: https://doi.org/10.1016/j.amjopharm.2012.04.002. 22. Qian J, Simoni-Wastila L, Rattinger GB, et al. Association between depression and maintenance medication adherence among Medicare beneficiaries with chronic obstructive pulmonary disease. Int J Geriatr Psychiatry. 2014;29(1):49-57. doi: https://doi.org/10.1002/gps.3968. 23. Khdour MR, Hawwa AF, Kidney JC, Smyth BM, McElnay JC. Potential risk factors for medication non-adherence in patients with chronic obstructive pulmonary disease (COPD). Eur J Clin Pharmacol. 2012;68(10):1365-1373. doi: https://doi.org/10.1007/s00228-012-1279-5. 24. Yu YF, Hearld LR, Qu H, Ray MN, Kilgore ML. 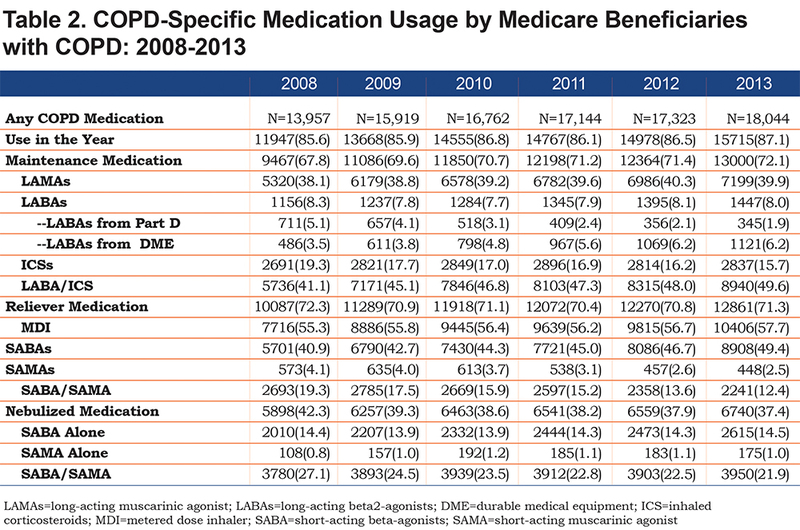 Association of Part D coverage gap with COPD medication adherence. Am J Manag Care. 2016;22(8):e275-282. 25. Doll JA, Hellkamp AS, Goyal A, Sutton NR, Peterson ED, Wang TY. Treatment, outcomes, and adherence to medication regimens among dual medicare-medicaid-eligible adults with myocardial infarction. JAMA Cardiol. 2016;1(7):787-794. doi: https://doi.org10.1001/jamacardio.2016.2724. 26. Restrepo RD, Alvarez MT, Wittnebel LD, et al. Medication adherence issues in patients treated for COPD. Int J Chron Obstruct Pulmon Dis. 2008;3(3):371-384. doi: https://doi.org/10.2147/COPD.S3036. 27. Darba J, Ramirez G, Sicras-Mainar A, Francoli-Martinez P, Torvinen S, Sanchez-de la Rosa R. The importance of inhaler devices: an incorrect inhaler technique leads to suboptimal medication compliance in patients with COPD. Value Health. 2015;18(7):A362. doi: https://doi.org/10.1016/j.jval.2015.09.703. 28.Goodwin R, Heraghty J. Do healthcare professionals understand asthma devices? Arch Dis Child Educ Pract Ed. 2015;100(6):302-305. doi: https://doi.org/10.1136/archdischild-2015-308779. 30. Davis E, Marra C, Gamble JM, et al. Effectiveness of a pharmacist-driven intervention in COPD (EPIC): study protocol for a randomized controlled trial. Trials. 2016;17(1):502. doi: https://doi.org/10.1186/s13063-016-1623-7. 31. van der Molen T, van Boven JF, Maguire T, Goyal P, Altman P. Optimizing identification and management of COPD patients - reviewing the role of the community pharmacist. Br J Clin Pharmacol. 2016. doi: https://doi.org/10.1111/bcp.13087. 32. Pilcher J, Holliday M, Ebmeier S, McKinstry S, Messaoudi F, Weatherall M, et al. Validation of a metered dose inhaler electronic monitoring device: implications for asthma clinical trial use. BMJ Open Respir Res. 2016;3(1):e000128. doi: https://doi.org/10.1136/bmjresp-2016-000128. 33. Bernheim SM, Parzynski CS, Horwitz L, et al. Accounting for patients' socioeconomic status does not change hospital readmission rates. Health Aff (Millwood). 2016;35(8):1461-1470. doi: https://doi.org/10.1377/hlthaff.2015.0394.